Time to save the Earth with the power of Metal! Gal Metal is a drummer’s game. Now don’t let that intimidate you. This may be a game for drummers, but you do not need to be a drummer to play this. Some musical background does help, but it’s not necessary. That said, this is probably the most freeform and open-ended music game I’ve seen outside of music creation tools. While I normally would find something like this intimidating, instead I found myself utterly captivated in learning the ways of Gal Metal and now I’m here to share that knowledge with you. But first, what is Gal Metal? 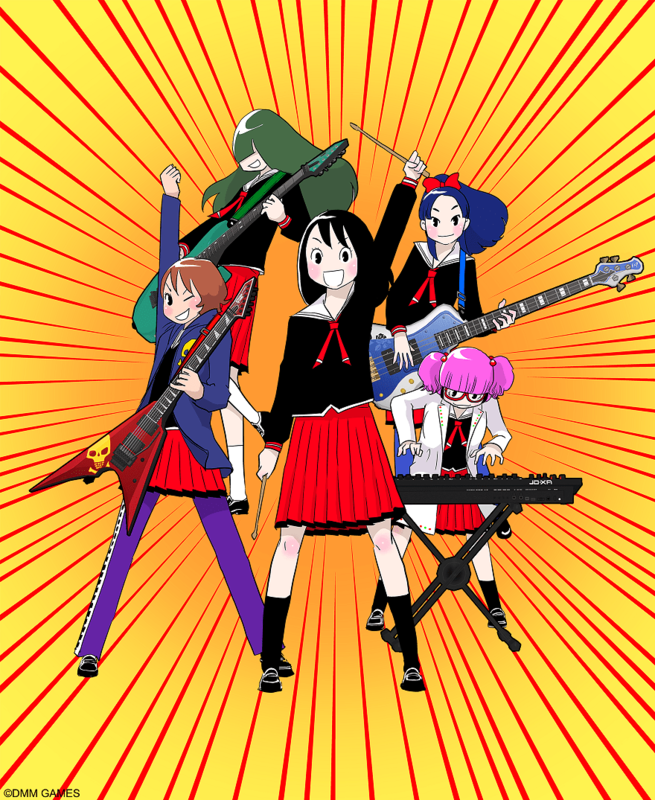 Gal Metal is a drum-based rhythm game with a premise that could only be from Japan due to its crazy-awesomeness. Aliens are invading the earth and only the power of Metal can defeat them. Together, with your school’s all-girl metal club, you’ll need to beat back the invaders using your Joy-Con controllers. But how does one accomplish this? Well, first we need to talk about a basic music concept: 4/4 time. You all know what a beat is. Listen to any song and I’m sure you can pick out the general beat. 4/4 (pronounced “four four”) time is a simple way to say each measure of music has four beats. It’s the simplest timing you learn when playing an instrument. Gal Metal is no different. The game uses 4/4 timing for its patterns and scoring. This means that if you can find a beat, you can play this game. Really, it’s that simple. So, how do you play then? Drumming in Gal Metal is simple. Just swing your Joy-Con to the beat. The right Joy-Con is for the drum, the left the snare, and both make a cymbal crash. Simple, right? Well, now comes a twist. In most rhythm games, you must follow an onscreen guide. In Dance Dance Revolution you match your steps with the arrows in the guide. In the Hatsune Miku games, it’s timing button presses. Gal Metal has no guide. This led me to ask XSEED Games a simple question. How do you play the game then? There must be a way to judge my performance, after all. See that bar along the top? That tracks your progress in the song as well breaks the song down into various sections. This is where the concept of 4/4 timing comes into play. You’ll have four beats to make a pattern. Say you just use the right Joy-Con and drum on-beat four times in a row. Well, that’s a pattern. The game has several and they are all named. You can combine any of these patterns together to play the game. However, if you really want to send your score into the stratosphere you’ll need to learn a few more things. Let’s start with going back to those patterns once again. Every pattern is part of a family. There are different families of patterns and each family has several patterns in it. It’s important to remember this because chaining patterns from the same family will earn you bonuses. Each song has several sections. For example, a song can have an intro, A section, A refrain, B section, B refrain, etc. Performing patterns from one family during a section will earn you a section bonus. Doing this for the refrain as well will earn you another bonus. It’s these bonuses that really help your score. My first few attempts had me scoring just over 100,000 points. My final attempt had me nail a few section bonuses and score over 500,000. These bonuses really do add up; however, you really shouldn’t focus too much on them. To explain why I’m going to ask you look at the video below which features the producer Tak Fujii demonstrating the game at XSEED’s booth. For those who are unable to watch the video (or if it’s is down in the future) let me summarize Tak Fujii’s point. 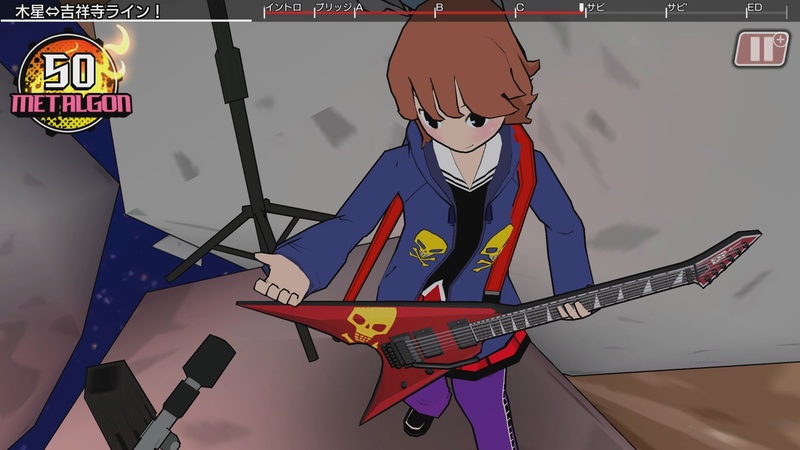 Gal Metal is a game designed for you to have fun; not for you to stress over. Let’s go back to that 500,000-point run I did. I attained that while not looking at the screen or focusing on what I was doing. I merely listened to the music and shook the Joy-con as if I was trying to keep a beat. I wasn’t doing anything fancy, I was just enjoying myself and the music. 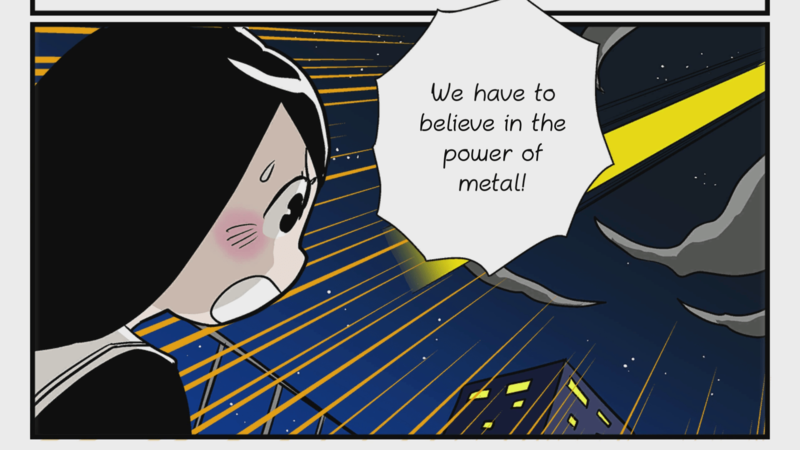 And that my friends is what Gal Metal is about. While I do think it’s important to demystify the underlying mechanics, it should not be the focus of the game. This is a game for you and your friends to play around with and just enjoy. If you just want to drum and find your own beat, go for it. You don’t need to be a percussionist to play this. Heck, my background in music comes from playing flute in middle school and the occasional round of Dance Dance Revolution or Project Diva. If I can do this, so can you. Believe in the power of metal and in your own rhythmic abilities. Remember to have fun with this one and not stress out over the little things. Gal Metal will be releasing for the Nintendo Switch this fall. Be sure to keep an eye on this one and look forward to our interview with Tak Fujii himself!